As a journalism student at the UW, my graduation requirements included a class where students were required to publish stories in the local press. Way back then, before those of us with writerly aspirations had a blog (and next thing you know a book contract), those “clips” were journalistic currency: a bridge to a career as a wordsmith. 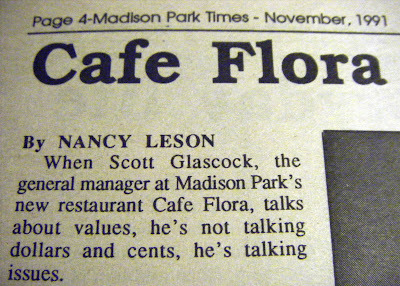 Political correctness is the buzzword of the 90s, but Cafe Flora is providing more than lip service in that department. The restaurant was originally an abandoned laundromat next door to a four-unit residential building. Rather than destroying the four-plex, the owners moved it to 22nd and Madison, keeping it in the neighborhood and donating it for use as affordable housing. The original structure of the laundromat was incorporated into the restaurant’s design. 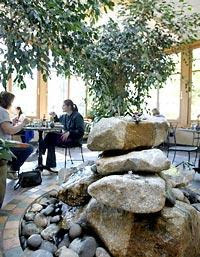 Cafe Flora’s interior includes energy-efficient refrigeration and heating, toxic-free fiberboard tables, and a non-toxic paint. Outside, an enclosure houses a recycling operation that includes an industrial size computer [sic]. A large herb garden adds aesthetic as well as culinary value to the property. By the way, I’ll never forget seeing that line about the “industrial size computer” in print. It should have read “composter” — an editor’s error, not mine. I was mortified! But I forgave that editor long ago, and laugh about it now that I’ve made a mountain of page-proof faux-pas myself. 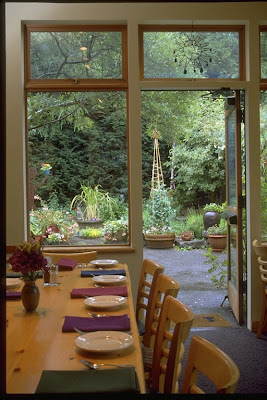 Few restaurants come with a mission statement, but Cafe Flora did. The owners (a couple who chose to keep their names out of the spotlight) and their managing partner (the late, great Scott Glascock) met through the peace movement a decade before. With Cafe Flora, they wanted to open more than just a “restaurant.” Instead, they hoped to forge a center for their community. And that community was meant to embrace their employees as well as their customers. Bear in mind, this was long before Seattle had fine-dining meatless options like Carmelita and Sutra. Instead, we had places like the venerable Moosewood-esque Sunlight Cafe and the tiny spiritually motivated Silence-Heart-Nest. As a chronicler of restaurants and a Cafe Flora fan, I’m pleased to report that while other iconic restaurants are closing, Flora is not only surviving, but thriving. And nearly two decades after its debut, the more things change, the more they stay the same. Four years ago Nat Stratton-Clarke took a job as buyer for Cafe Flora — procuring produce directly from local farmers, shopping at farmers markets several times each week and seeking out local products to showcase in Madison Valley. Soon, he was running the restaurant as GM. 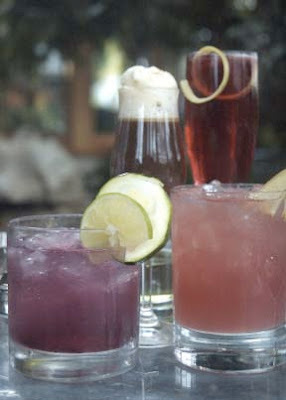 Then, late last summer, the restaurant quietly changed hands. Original owner David Foecke, now living in the Bay Area, decided it was time to move on, and when he looked for someone to continue carrying out his mission for Cafe Flora, he didn’t look far. Carpet will be replaced by soy-stained concrete, rather than the toxic acid commonly used in the staining process. New walls, display cases and a door to the children’s play area have been fashioned from recycled wood. Much of that wood was scavenged from local farms. Berry crates from Alm Hill Gardens and an old beehive from Rockridge Orchards will be made into shelving. An old barn door from Local Roots Farm is set to become a wall. And additional seating at the newly configured bar area — whose liquor display cases are also reclaimed — will spotlight a recent addition: a cocktail menu. Herbs from the garden I wrote about in 1991 are still in use in the spacious kitchen, whose recipes are yours for the price of the Cafe Flora Cookbook, dedicated in 2005 “In loving memory of Scott Glascock.” As for that industrial-sized “computer”? It’s no longer there, though there is a garden worm-bin. These days, says Stratton-Clarke, “We fill two huge Dumpster-sized bins of compostable waste every week.” Those bins are emptied and their contents made into compost at Cedar Grove. In return, he says, Cedar Grove’s compost is used in Flora’s garden plot. What’s more, the circle is unbroken when you take food to-go: it’s carted off in compostable packaging products from Cedar Grove.